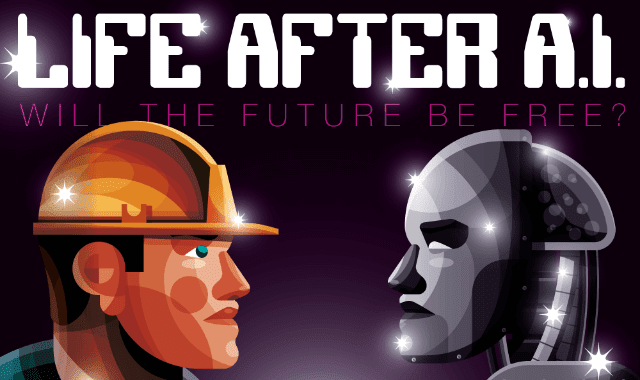 Life After AI: Will The Future Be Free? #Infographic ~ Visualistan '+g+"
On average, one robot does the work of about five people and by 2025 the number of working robots in the US could quadruple. It’s easy to let our imaginations run wild, after all, humankind has always been fascinated with creating artificial intelligence, its morality, and its potential destructive nature. However in reality, automating jobs with AI is the kickstart we need to move towards more meaningful and uniquely human experiences. By automating the necessary work, us humans can focus our creative energy into the field of our choice. Artistic and musical endeavors, volunteer work, passion projects, and just plain early retirement could all be very real options for us in the future. Earning a living will no longer be the motivation of work in this automated future; labor costs decrease due to the smaller workforce which in turns decreases the cost of goods and services. The livable wage will plummet as many goods can be manufactured at very low cost and in some cases completely free. There is nothing to fear from job automation (outside of science fiction, of course), and in fact the growth of working robots will propel us into a future that we never could have imagined. By 2033, nearly 50% of US jobs will be up for grabs for automation from industrial robots - will you be ready?